Spider Plant (Chlorophytum comosum Variegatum) is a beautiful decorative plant with long arching narrow leaves coming from the center. These leaves have green edges with white stripes down the middle and some have white edges with green central stripes. This plant also shoots out long arching stems that produce small, white star-shaped flowers and then plantlets that can be easily propagated or allowed to dangle from the stems. These stems can grow as long as 40 inches, and the plant blooms throughout the summer months. 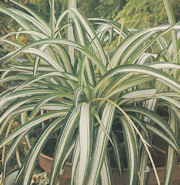 The Chlorophytum comosum Variegatum is extremely attractive when grown in hanging baskets or placed on a pedestal. This easy care plant is ideal for beginners because it not easy to kill, It can survive several days without watering and adapts well to the indoor environment. The spider plant is a natural defense tool against indoor air pollution. It improves the air quality by getting rid of toxins such as benzene and formaldehyde. You cannot avoid VOCs because they are found in such a wide variety of the products in our indoor environment; however, you can take steps to make your air healthier by having this plant in your home. Place 2 mature specimen plants in a 100 sq ft room to remove toxins from the air where you spend time. Light: Prefers moderate to bright light (near bright east or south window). Temperature: 55 to 85 degrees Fahrenheit, but can tolerate temperatures as low as 40 degrees without damage. Keep plant away from heating vents or cold drafts. Humidity: The plant likes average humidity. Mist daily with lukewarm water during warm months and twice a week during winter when the temperature is over 60 degrees F.
NOTE: Plant is fluoride-sensitive. Use distilled water or water that has sat for at least 24 hours. If you have an aquarium, it thrives on that water. This is necessary to prevent brown tips. Propagation: Propagation can be done by division or with plantlets separated from the parent plant. Repotting: Plant likes to be pot bound. Repot with well-aerated potting mixture when repotting. You will find the spider plant to be ideal because it needs no special room temperature and it can grow in both light and shade. In addition, this easy-to-grow plant is as good for the indoor environment as it is beautiful.